Few things frustrate me as much as trying to make vegetable chips and failing completely. The kitchen is in mess, everything is coated in a layer of oil (including myself) and the result is so hopelessly bad that it has to go right into the bin. My parsnip chips from a couple months ago turned out so perfectly that I felt brave enough to think it would be that easy with any kind of roots or greens. But I was wrong. 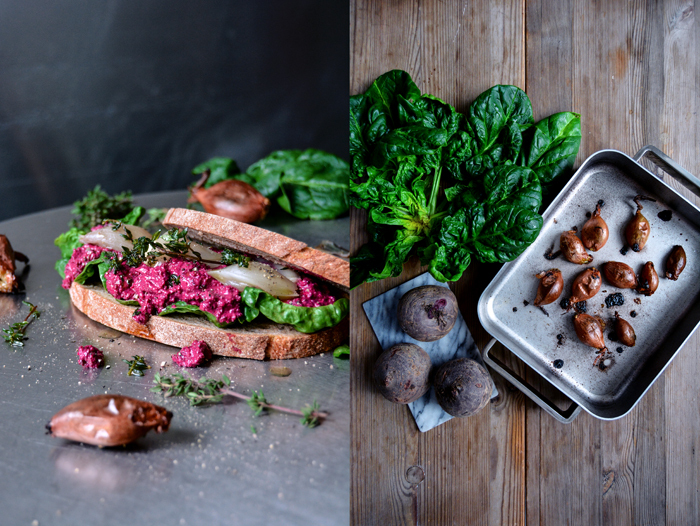 I had thin, crisp beetroot and spinach bites on my mind but a burnt disaster on my plate. 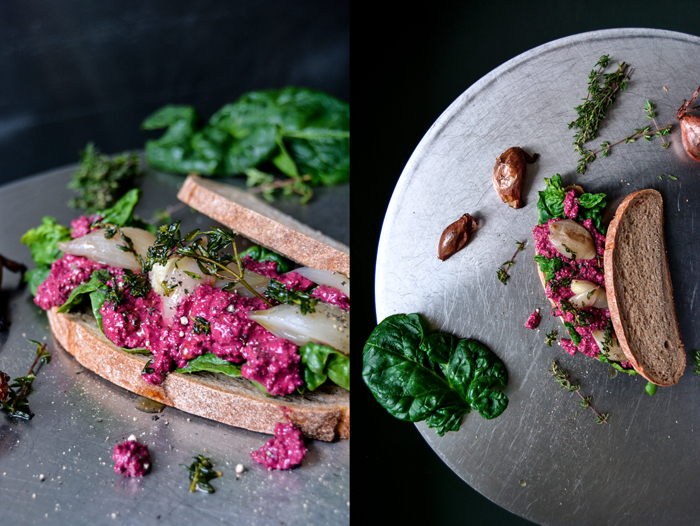 It was so frustrating as I already had the perfect sandwich for this composition ready in my head: the chips were supposed to lay gracefully on a bad of sweet, juicy shallots roasted in the oven in their skins. I could already see the bright purple and green screaming in front of the pale onions. But reality was different. There was no bright anything but a black, bitter disaster. I know I should have done it before, but afterwards I read and learned that beet chips can be cooked in the oven, which should be much easier. At that point my mood had reached such a low point that I decided to go for a different creation. I looked at the two beetroots that were lucky enough to escape the scorching hot oil in the pan and stuffed one of them in a blender along with some fresh ricotta, olive oil, thyme, and lemon juice. You could boil the root first but I actually enjoyed the crunchy raw bites in the dip. Fried thyme was next and a success – the tiny leaves thrown into sizzling olive oil and taken off the heat immediately, were just right – neither dark nor bitter. And all this piled up on a thick leaf of raw spinach. You could make a juicy ciabatta sandwich with it but I was too lazy to go to the bakery so I grabbed my dark spelt potato bread. It added heartiness to the earthy flavours. 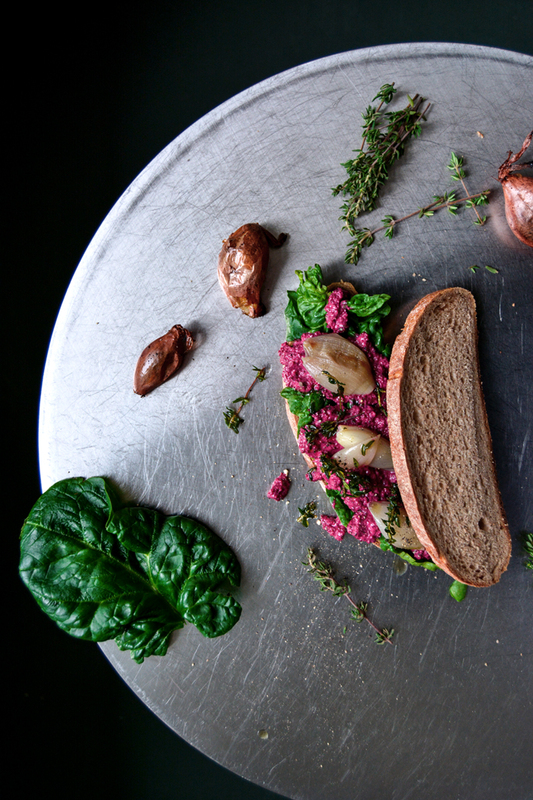 This is a proper winter sandwich, stuffed with taste and vitamins. 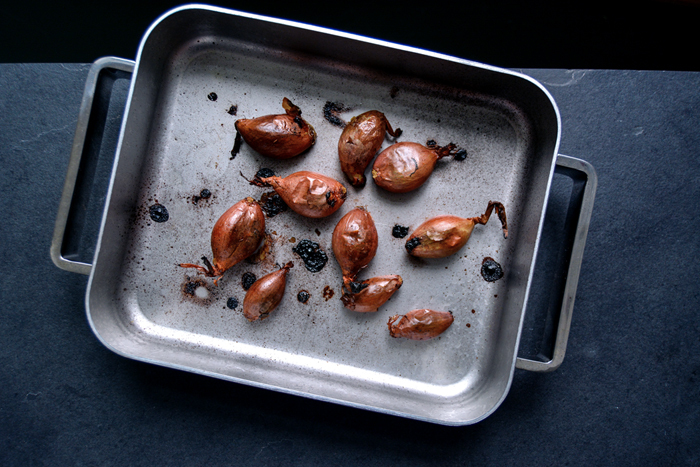 For the roast shallots, in a baking dish, toss the shallots with 1 tablespoon olive oil. Roast for 15 minutes, then turn them over and roast for 15 minutes on the other side. If they feel soft when you push them down gently, they’re done; set aside. For the beet-ricotta dip, combine the ingredients in a blender or food processor and pulse until smooth. Season to taste with salt, pepper, and thyme. If the dip is too dry, add more olive oil. For the fried thyme, heat the olive oil in a small saucepan over high heat, add the thyme sprigs. Take off the heat immediately and set aside. 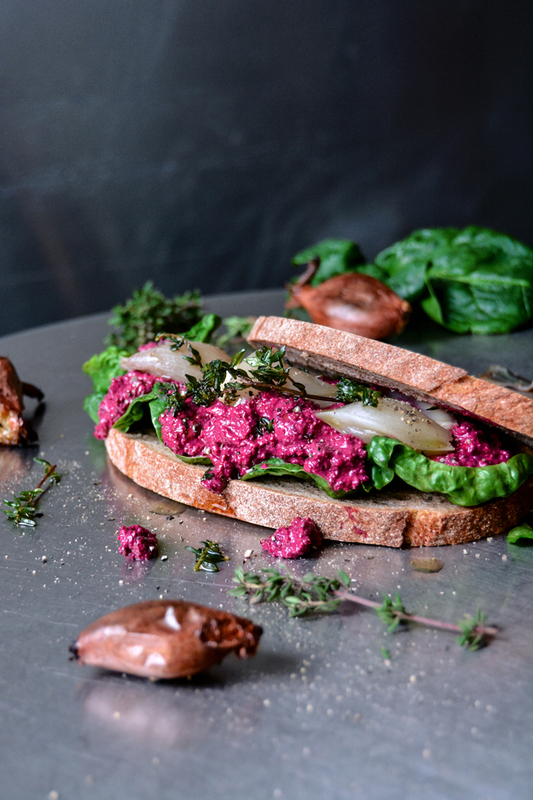 Brush 2 slices of the bread with the thyme oil from the saucepan and cover with spinach leaves. 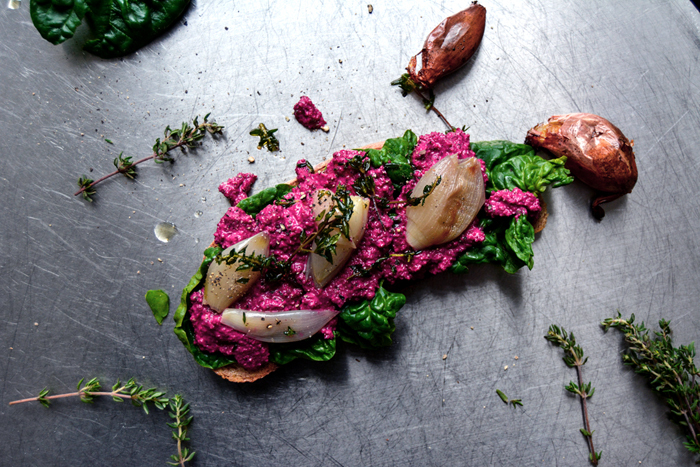 Sprinkle with generous dollops of the beet-ricotta dip. Snip the ends off the roast shallots and squeeze them out of their skins onto the dip. Lay some fried thyme on top and sprinkle with crushed peppercorns. Close the sandwich and enjoy.